All 3 of our readings today reference, in one way or another, the end times. I think for a lot of people the thought of “Heaven and earth passing away” can be a little scary. But we shouldn’t be scared by any of this, we should actually be looking forward to it. As children of the living God who have accepted Jesus Christ as their savior and have a relationship with Him, why would we not be looking forward to spending eternity with the God who loves us so much that he sent his only son to die for US. God is longing for the day when we will all be with him, so why aren’t we longing for that day as well? God has called each and every one of us, not just the perfect, not just the rich, not just Americans, He has called everyone. But the real question is, have you responded to that call? Now God is omnipotent so if he really wanted to he could just say everyone is going to spend eternity with me whether they want to or not. But if you really think about it, that is demeaning to us, it takes away any choice we have in the matter. But God loves us so much and values us so much, that he gave us this pesky thing called free will. We have the ability to choose to do whatever we want. When you wake up in the morning, you can choose to get out of bed or stay in bed. Now there are consequences to our choices. For instance, losing your job if you stay in bed every day and don’t go to work. There are also situations where our ability to choose is taken away, like if you break the law and go to jail, you lose the ability to choose certain things, but again, that consequence was the result of a choice. Sometimes we also have to suffer consequences based on choices others make, for example, if someone chooses to drive drunk and runs into our car. We experience a consequence from someone else’s choice. 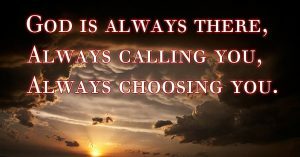 But regardless of any choice we have made in our lives, or others have made for us, regardless of how bad we have messed up, God ALWAYS ensures we have the choice to choose him, and he never stops calling us to make that choice. Now, in a perfect world where there were no evil forces working to pull us away from God, that choice would be easy, but we do not live in a perfect world. We live in a fallen world where bad things happen to us, whether we choose God or not. Unfortunately, we live in a world where we are even persecuted for choosing God. Don’t be fooled into thinking this means God is punishing us. There is a difference between allowing something to happen and making that thing happen. We live in a fallen world which means there is evil in the world, there is evil in the world because of a choice made long ago. It wasn’t our choice, but it was a choice that limited our choices, a choice that caused us to live with a consequence. We can’t choose to not know what evil is, to not experience evil, to not hear about it, because it happens all around us. But, we can choose how we respond to that evil, we can choose to let it influence us and pull us away from God, or we can choose to see it for what it is, and know there is a God who wants us to fight it, to choose Him instead of falling into the trap Satan has set for us. So, you see, those end times we can all be so scared of, they are really the finish line, the ultimate retirement, the reward for fighting the good fight, rest and peace in a God who loves us. Are you looking forward to it or are you still scared of it? I guess it really depends on how you have chosen. Have you chosen to accept God or chosen to reject him and accept the world? 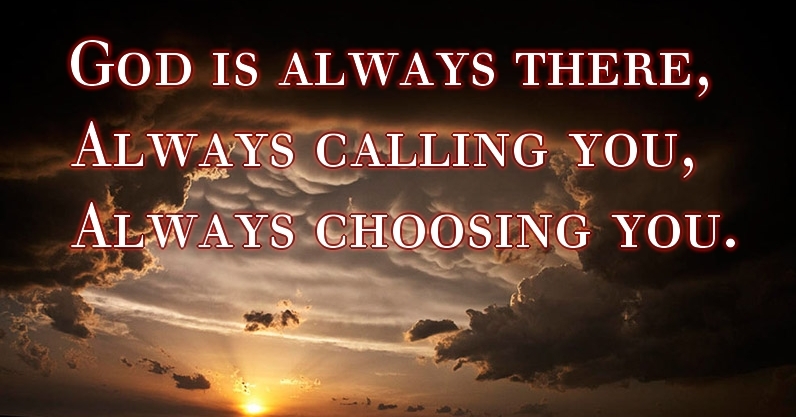 Remember, God is always there, always calling you, always choosing you, won’t you choose Him?